Eight Missions as Group Lead Crew Pilot: 294 (31 Dec 44), 317(Abort), 322, 326, 330, 338, 342, 349 (31 Mar 45). Captain Harold L. Stouse (P) - Was an original Pilot assigned to 359th BS on 24 June 1942 at Boise, Idaho. Flew on seventeen dispatched (16 credited missions) with his 359th BS Crew (17 Nov 1942 through 17 April 1943). The Stouse crew received orders returning them to the USA to take part in special assignments in the 3rd Air Force which was training replacement crews. Was Pilot on mission 24, 18 March 1943, on which his Bombardier, 1Lt Jack W. Mathis was killed and awarded the Medal of Honor. See 359th BS Harold L. Stouse Crew web page for details on his 359th BS missions. Captain Stouse grew tired with his training assignment and requested transfer back to the 303rd BG(H) which was approved. He arrived at Molesworth and was assigned to the 360th BS on 27 October 1944 and flew on 16 additional credited combat missions. Became a Lead Crew Pilot and served as the 360th BS Operations Officer. Capt Stouse flew on three missions (267, 268, 271) with his new crew before being assigned as a Lead Crew Pilot. His crewmen became 360BS utility crewmen who flew with many different Pilots. Captain Stouse completed 32 credited missions with the 359th and 360th Bomb Squadron on 10 April 1945 (Mission 357) for a credited combat tour. 2Lt Raymond E. White (CP)(KIA) - Missions flown: Three with Capt Stouse (267, 268, 271). Fifteen with other Pilots - Total 18 missions Was killed on 21 January 1945 (Mission 305), 1Lt Richard Duffield (P) in B-17G 44-8137 (No name) 359BS (BN-Z) flying as a Tail Gunner/Observer. 1Lt Duffield's B-17 caught the right wing of the Lead B-017 of the 2nd Flight, B-17G 42-97058 Scorchy II (359BS), 2Lt Richard F. Tasker (P). Both B-17's lost wings and crashed near Rottweil, Germany. 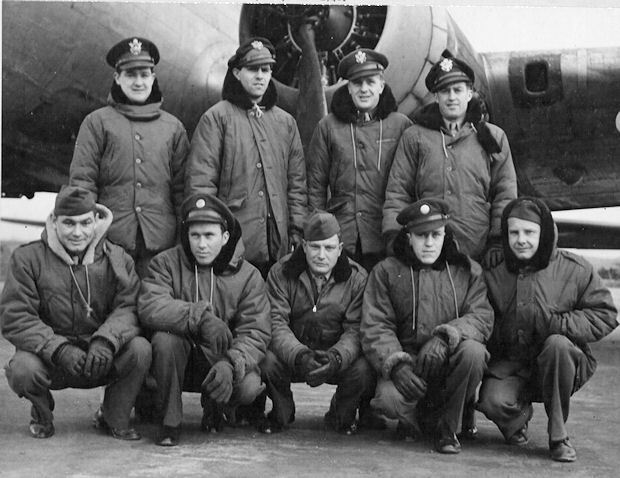 There was only one POW survivor in each of the two B-17s. 2Lt Raymond E. Papp (N) - Missions flown: Four with Capt Stouse (267, 268, 271, 322); Twenty-Six with other Pilot. Last fifteen missions flown as a Lead Crew Navigator. Completed his 30 mission combat tour on 9 April 1945 (Mission 356). 2Lt James L. Puryear (B) - Missions flown: Four with Capt Stouse (267, 268, 271, 357); Twenty-five with other Pilots - sixteen as a Lead Crew Bombardier. Completed 29 combat missions on 25 April 1945 (Mission 264). T/Sgt George F. Bostwick (E) - Missions flown: Seven with Capt Stouse (267, 268, 271, 322, 326, 338, 342; Nineteen with other Pilots - six as a Lead crew Engineer. Completed 26 combat missions on 21 March 1945 (Mission 342). T/Sgt Joseph D. Lillis (R) - A remarkable USAAF crewman and hero. 27 year old T/Sgt Lillis was a veteran of the early days of the Pacific War against the Japanese. Flew on 76 difficult missions in the Pacific and was awarded the Distinguished Service Cross, Silver Star, DFC and Air Medal with clusters. Sometime after returning to the USA from the Pacific Theater he requested an assignment to the 8th Air Force. and became the 360th BS Capt Stouse crew Radio Operator on 27 Oct 1944; 360th BS Missions flown: Eight with Capt Stouse (267, 268, 271, 322, 326, 338, 349, 357); Twenty-one with other Pilots. Completed twenty-nine 360BS mission combat tour on 16 April 1945 (Mission 361). With his 76 Pacific missions he completed 105 combat missions - the most flown by any 303rd BG(H) crewman. S/Sgt James H. Gilbert (BTG) - Missions Flown: Three with Capt Stouse (267, 268, 271); Seventeen with other Pilots. Completed twenty combat missions on 14 April 1945 (Mission 359). S/Sgt Leo F. Wotanis (WG) - Missions flown: Eight with Capt Stouse (267, 268, 271, 322, 326, 338, 349, 357; Twenty-one with other Pilots. Completed 29 mission combat tour on 14 April 1945 (Mission 359). S/Sgt James O. Carter (TG) - Missions flown: Four with Capt Stouse (267, 268, 271, 357); Nineteen with other Pilots. Completed 23 combat missions on 16 April 1945 (Mission 361).